Ce document au format PDF 1.5 a été généré par OmniPage 12 http://www.scansoft.com, et a été envoyé sur fichier-pdf.fr le 13/09/2015 à 13:41, depuis l'adresse IP 88.186.x.x. La présente page de téléchargement du fichier a été vue 732 fois. Taille du document: 54 Mo (488 pages). design specifications may cause damage to the motorcycle . 2 . Use the special tools designed for this product to avoid damage and incorrect assembly . 4 . Install new gaskets, O-rings, cotter pins, and lock plates when reassembling . diagonally in incremental steps unless a particular sequence is specified . 6 . Clean parts in cleaning solvent upon disassembly . Lubricate any sliding surfaces before reassembly . 7 . 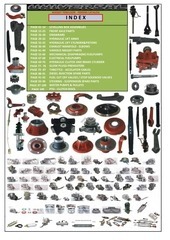 After reassembly, check all parts for proper installation and operation . 8 . Route all electrical wires as show on pages 1-23 through 1-39, Cable and Harness Routing . right side of the steering head . side of the upper crankcase . .15 (0 .006) max . Valve guide I .D . Valve stem O .D . Fork shaft O .D . Starter driven gear boss O .D . Piston pin bore I .D . C onnecting rod small end I .D . _Master cylinder I .D . _Master piston O .D . Caliper cylinder I .D . Caliper piston O .D . Master cylinder I .D . Master piston O .D . 0 .2 mA max . 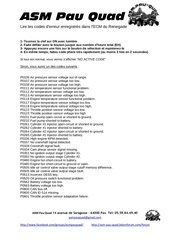 • Torque specifications listed below are for important fasteners . 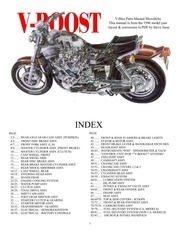 • Others should be tightened to standard torque values listed above . Apply sealant to the threads . Apply a locking agent to the threads . Apply grease to the threads . Apply oil to the threads and flange surface . Apply clean engine oil to the O-ring . ALOC bolt : replace with a new one . 1 .Equivalent commercially available in U .S .A . 2 .Not available in U .S .A . 4 .Newly provided tool . 5 .Newly designed tool . Driver, 40 mm I .D . Attachment, 30 mm I .D . head 3 - 4 mm (0 .1 --0 .2 in) . system warranty in effect . react in the same way, but it is toxic . Honda Motor Co ., Ltd . utilizes lean injection settings as well as other systems, to reduce carbon monoxide and hydrocarbons . The engine is equipped with a closed crankcase system to prevent discharging crankcase emissions into the atmosphere . Blow-by gas is returned to the combustion chamber through the air cleaner and throttle body . crankcase emission control system . hydrocarbons and carbon monoxide into relatively harmless carbon dioxide and water vapor . (ECT/IAT/TP/MAP sensor and engine revolution) . the engine's exhaust to carbon dioxide (CO2), dinitrogen (N2), and water vapor . No adjustment to these systems should be made although periodic inspection of the components is recommended . This model complies with California Air Resources Board evaporative emission requirements . fuel vapor in the EVAP canister is drawn into the engine through the throttle body . design has been removed or rendered inoperative by any person . 1 . Removal of, or puncturing of the muffler, baffles, header pipes or any other component which conducts exhaust gases . 2 . Removal of, or puncturing of any part of the intake system . 3 . Lack of proper maintenance . on the storage compartment as shown . The seat must be removed to read it . It gives base tune-up specifications . air cleaner housing cover as shown . page 3-4 for fuel tank opening . 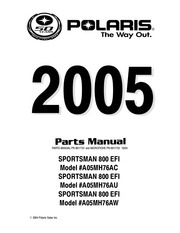 • This section covers removal and installation of the body panels and exhaust system . • Always replace the exhaust pipe gaskets after removing the exhaust pipe from the engine . • Always inspect the exhaust system for leaks after installation . Slide the seat back and then off . Remove the mounting collars . and install the seat . Install and tighten the socket bolts securely . Remove the seat (see above) . Open the pillion seat using the ignition key . Disconnect the rear brake/tail light connectors . Remove the two trim clips under the rear cowl . rear cowl, then remove it from the seat rail . not to damage the wire harness . Install the two trim clips . Install and tighten the mounting screws to the specified torque . Install the lower trim clips . Route the wire harness and clamp it as shown . Connect the rear brake/tail light connectors . the bracket mounting bolts/nuts . then tighten the bolts securely . Remove the trim clips from the inner middle cowl . Ce fichier a été mis en ligne par un utilisateur du site. Identifiant unique du document: 00353450.